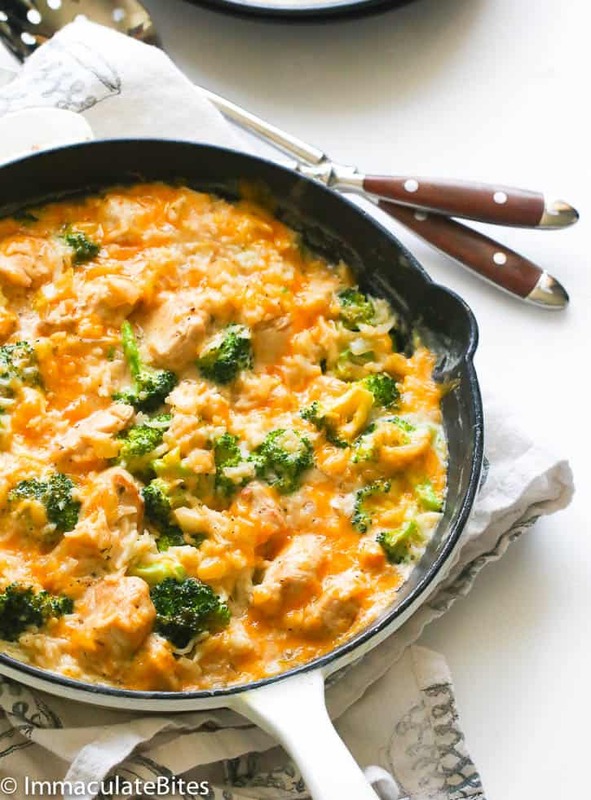 Chicken Broccoli Rice Casserole – a warm, filling and healthy one-pan meal that is Super Easy to make, delicious and an excellent choice for a healthy dinner. Perfect for those crazy weeknights! I have been pushing myself to eat healthy. Working at home doesn’t actually guarantee ME eating healthy food choices all the time especially when I’m always swamped with blogging work, house chores and motherly/wife duties. Please tell me this is healthy- this right right ? Look at those veggies. And when you have kid(s) in the house, you bet you want them to go the healthy route, too! But who says veggies and kids are absolute besties? My little fella would say it upfront that he doesn’t like a particular food. He used to love broccoli but not so much recently. So I’m up for a healthy mission A.K.A sneak-in-those-broccoli and make ‘em look kid-friendly. Now onto my second mission — that is to make you and your family love this to the point of making it frequently. 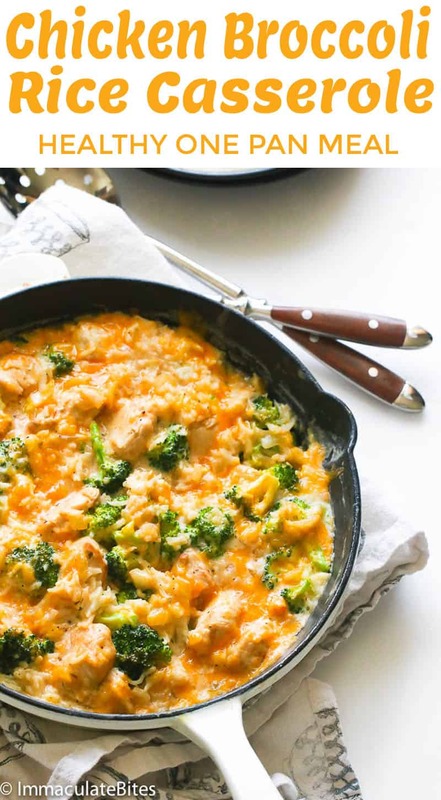 Well, aside from the fact that this dish has all the food group in one skillet, it’s also filling and money-saver. This is freezer-friendly, too. Oh yes!! Now, where are those frugal Mamas here? You can actually cook this in big batches and in advance, transfer to freezer-safe dish, cover tightly and freeze. 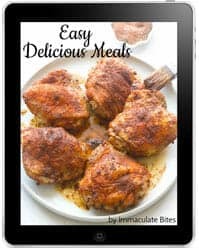 Just thaw it overnight in the refrigerator and dump it in a greased casserole dish and reheat for lunches and dinners throughout the week. The flavors in dish is simple yet sooo appealing. You don’t even need to sweat out during the prep stage. 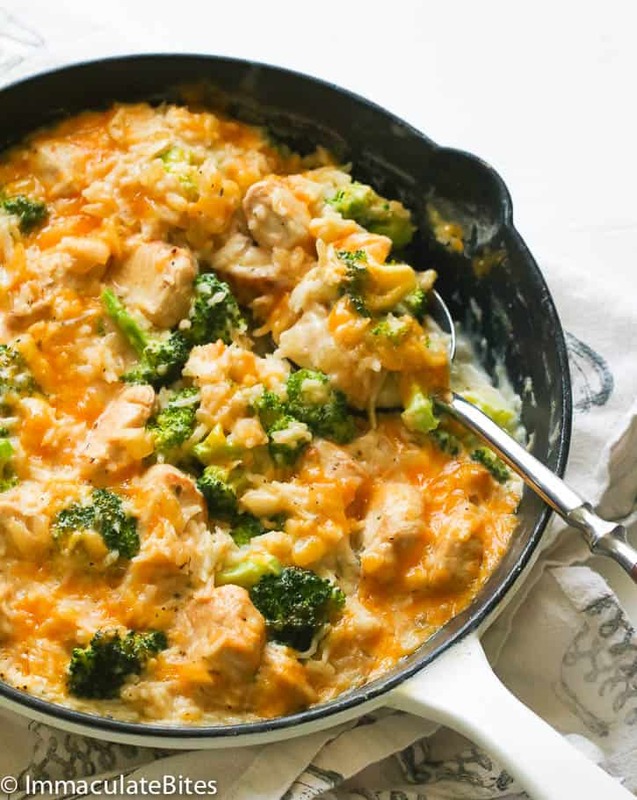 This Chicken Broccoli Rice Casserole could be your new favorite one-pan meal that is quick, healthy and tasty. Before you know it, dinner is ready to be served and devoured. 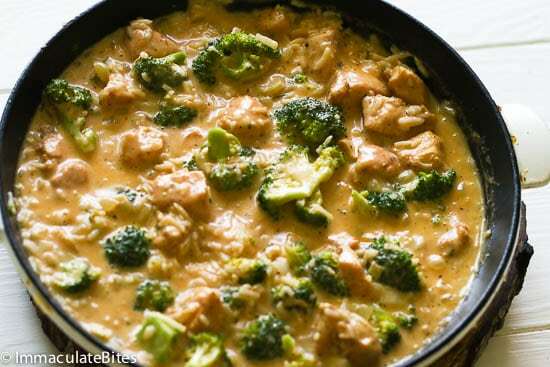 For a healthier option, you may opt to use brown rice over white rice for this recipe. 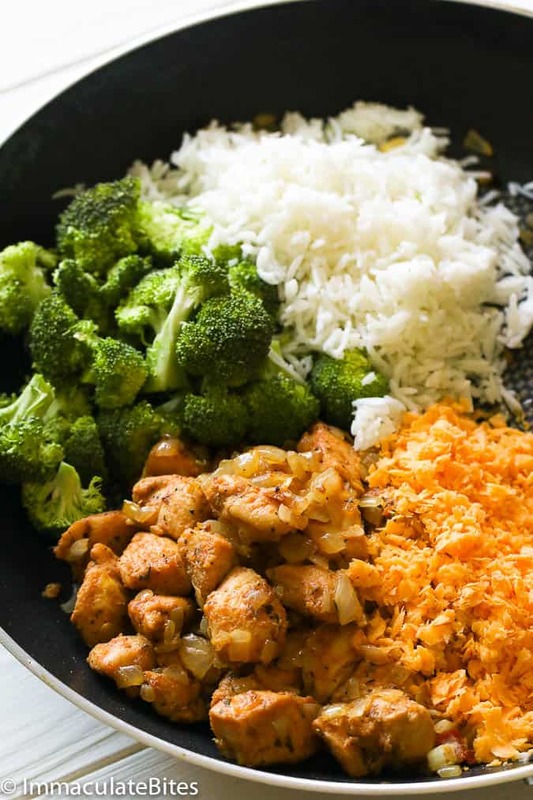 Feel free to swap rice with quinoa or another whole grain substitute and the broccoli for any sauteed vegetables. It all depends on your and your family’s preference. 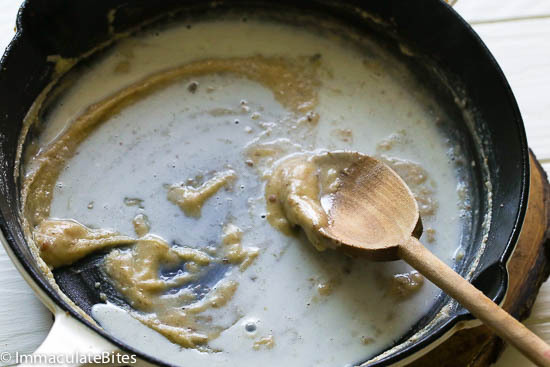 In freezing this dish, let it cool down before transferring to a freezer-safe dish. Cover it tightly and freeze for up to 2 months. If you’re ready to serve it up, thaw it in the refrigerator for about 8 hours before baking it at 350 degrees for 25-35 minutes. Or you can also bake it directly from the fridge and just add another 10 minutes or so when baking. 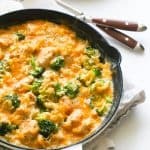 Chicken Broccoli Rice Casserole – a warm, filling and healthy one-pan meal that is Super Easy to make, delicious and an excellent choice for healthy dinner. Perfect for those crazy weeknights! 3/4 teaspoon or more salt adjust to taste. 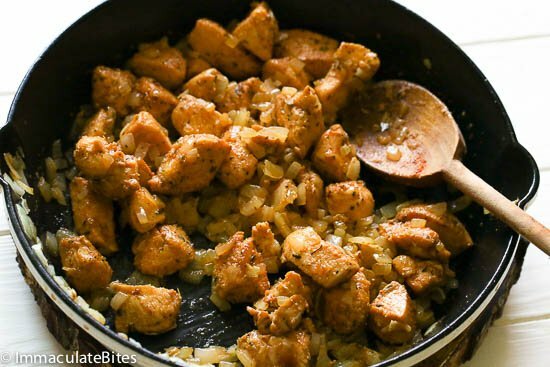 Heat oil in a skillet, stir in the chicken , cook the chicken for 3 to 5 minutes . Add minced garlic , stir for about a minute, followed by chopped onion , cook until onions wilted – about 4 more minutes . Remove and set aside. 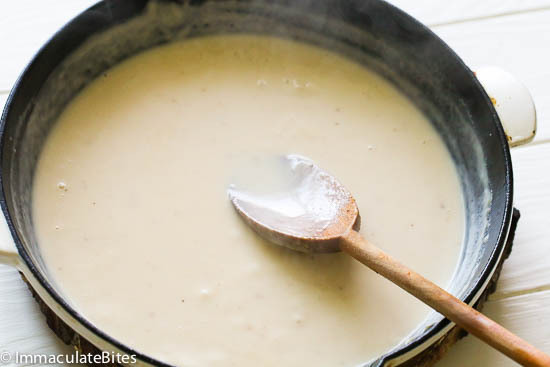 Slowly add chicken broth, a little at the time, followed by the milk , you do not want to mixture to form any lumps , bring to simmer then turn down to medium so it simmers gently and thickens into a cream sauce -about 6 -8 minutes. An easy way to gauge this is if the sauce coats the back of a wooden spoon, and a path with your finger. 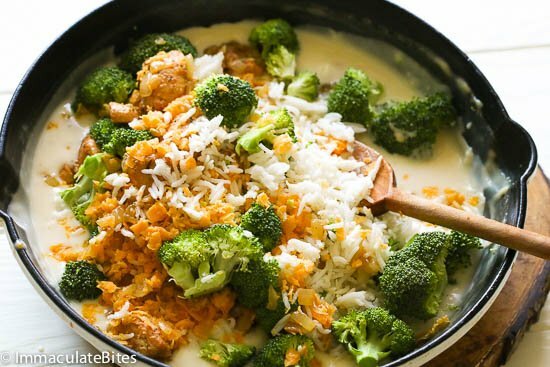 Turn off the heat and stir in the rice, broccoli , and ½ cup cheese and chicken. 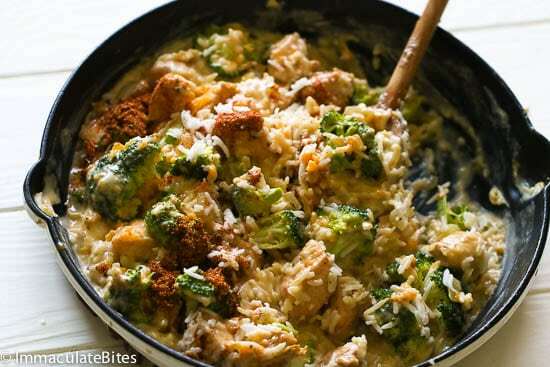 Stir add creole seasoning,salt , mix – adjust seasonings to liking .Top with remaining cheese . Bake, uncovered, at 350° for 15-30 minutes or until heated through. This was DELICIOUS and devoured by my family, including two teenagers who don’t usually love casseroles. I had rotisserie chicken on hand so just switched the order of things a bit, adding in the seasoning with the butter, onions, and garlic. I also doubled the recipe and we are all looking forward to leftovers tomorrow night. Thank you! I’m adding this to our regular rotation. I have made so many of your recipes and I forget to stop back to let you know. I actually made this today and I must say it was fabulously delicious. My youngest daughter does hates broccoli, but she ate this. The seasoning was so good, that we did not need anything once the meal was finally done. Bravo for another great and simple recipe. Thank you for letting me know, Fika! It really means a lot to me especially when kids dig in my recipes. 🙂 Have a lovely Sunday! Absolutely delicious!!! I can’t stop eating!!! This was soooo good! I love the simplicity but perfect blend of flavours. A lot of casserole recipes get so complicated which to me goes against the point of a casserole. The cajun spice is like a secret ingredient though. It totally made it extra delicious. The cajun seasoning truly works like magic. Thank you for taking the time to leave a comment for this post, Cait! Enjoy your day! Any cheese that is a semi hard or hard, creamy texture would likely do just fine (Jack, colby, and swiss cheeses) all work. Yes it is. Happy Cooking!!! 3 Times? WOO HOO! Glad to hear it’s on the menu. Thank you so much for taking the time to let me know!! I made this recipe and it was an absolute hit. I left out the Cajun spice in honor of my youngest who has no stomach for “strong” spices. I also added chopped bacon pieces which I already had on hand and needed a purpose. I was commanded to add this to the meal rotation with hearty assent from the whole table. A real compliment. Thank you for such a wonderful recipe. 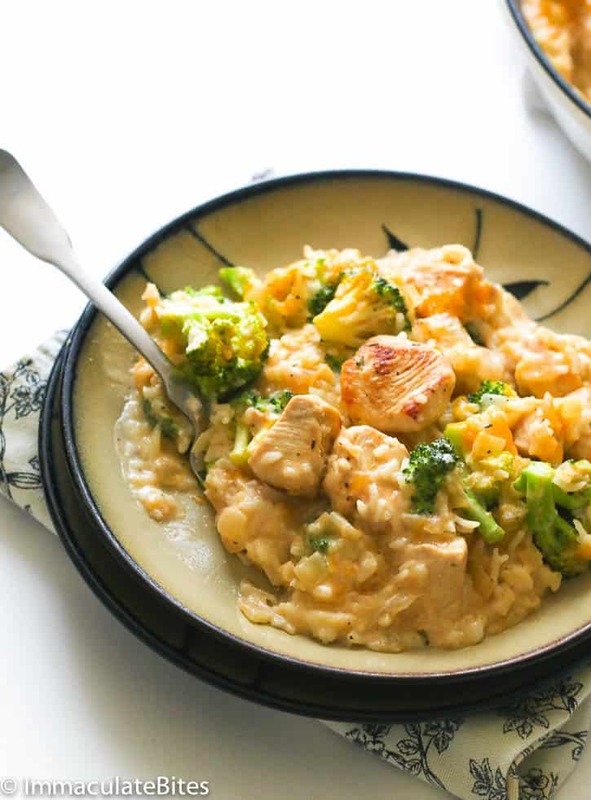 This working mom relishes new, family friendly meal ideas. YES! Am so glad to hear it was a hit with the whole family! Many thanks to your household. So happy you would take time out to share your thoughts with us. First time making and tasting a casserole, and I am so excited to say that it is AMAZING! Definitely flavorful and convenient to make. Cannot wait to explore the other recipes provided! An excellent recipe. Everyone commented how good it was. I’m looking forward to the Blackened Salmon and Sautéed Vegetables. That looks delicious too! YESS!! You are going to love that one too! I make it alllll the time . Thanks for taking the time to share this with me Sharon! This recipe looks simple AND amazing! 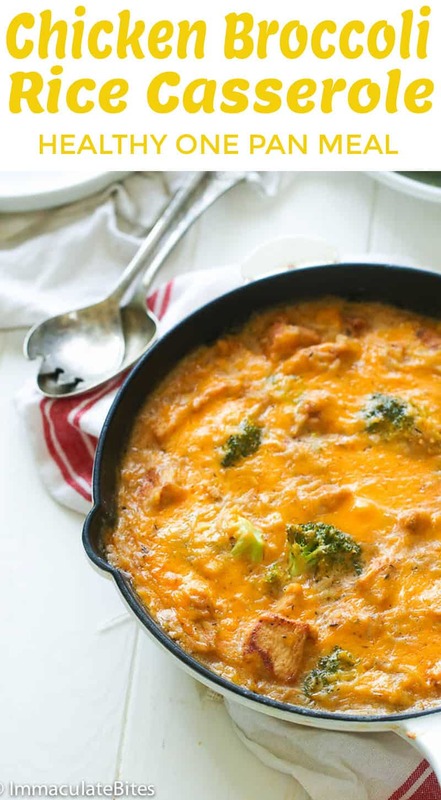 I will be delivering one casserole to my neighbor this weekend—and one to my freezer! 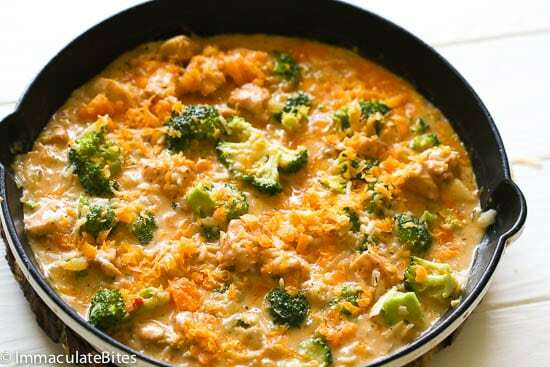 Easy, healthy, creamy comfort food, I love it! Always looking out for those chaotic weekday recipes for when my cooking enthusiasm is at an all time low! Adding this one to that list! Awesome! It’s perfect for those chaotic days!